I liked the TV show as a kid, and tried to replicate the car from the parts box and kit I I had on hand. Heres the result. Did you modify a two to a four door or did you have a resin body to start with?? thats pretty sweet.. nice job on the speaker. Its a 2 door Roadrunner massaged into a four door, with some stuff I had in the part box. The siren is actually a headlight bucket from an old 1950 Chevy pickup kit I never finished. 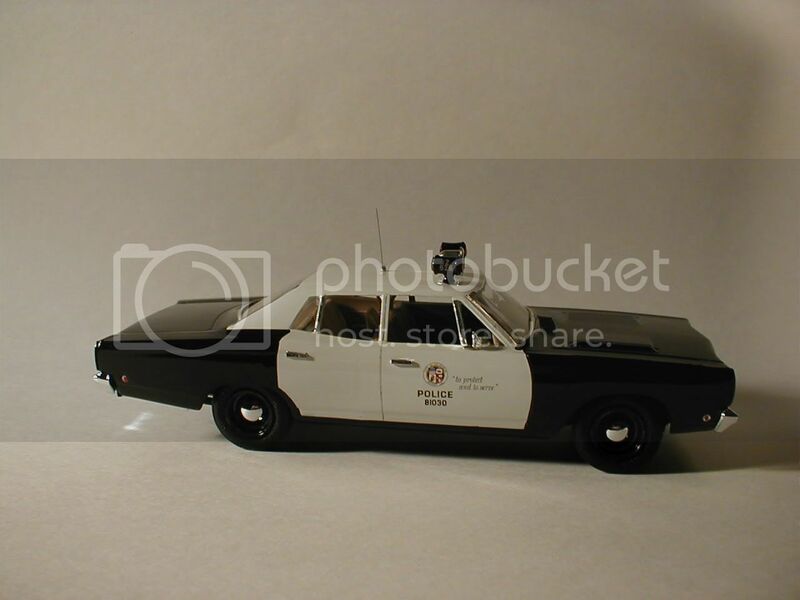 My inspiration was Tom Sheehy who did an excellent 68 LAPD Belvedere with a resin kit of the 4 door sedan (check out his stuff, its all over the net), and, of course, "The Professor" FIREMODELER , utilzing some info from his great tutorials posted here. 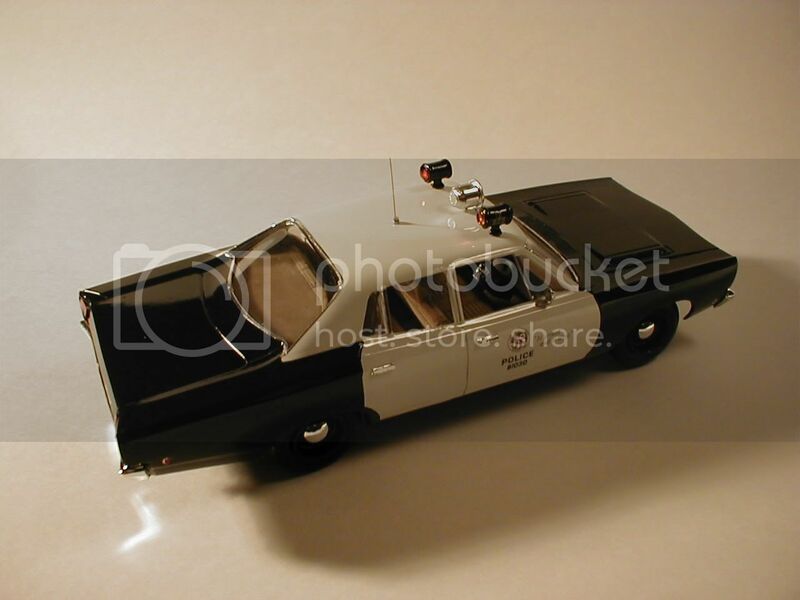 I also watched countless hours of Adam-12 (my eyes are still blurry from it). Thanks guys for sharing your techniques and artistry. Looks like you've done an excellent job of mastering the tutorials. The build is very impressive. WOW, great job. You probably did the right thing by modifying the kit instead of using the R&R Resin, I had such a tough time with that body, by the time I was done, the body had more putty and replacement plastic panels than it had resin!! I'm very proud that you mention me as your inspiration, glad I got somebody motivated. I'll post pics of mine some other day, don't want to steal your thunder. And again, GREAT JOB. 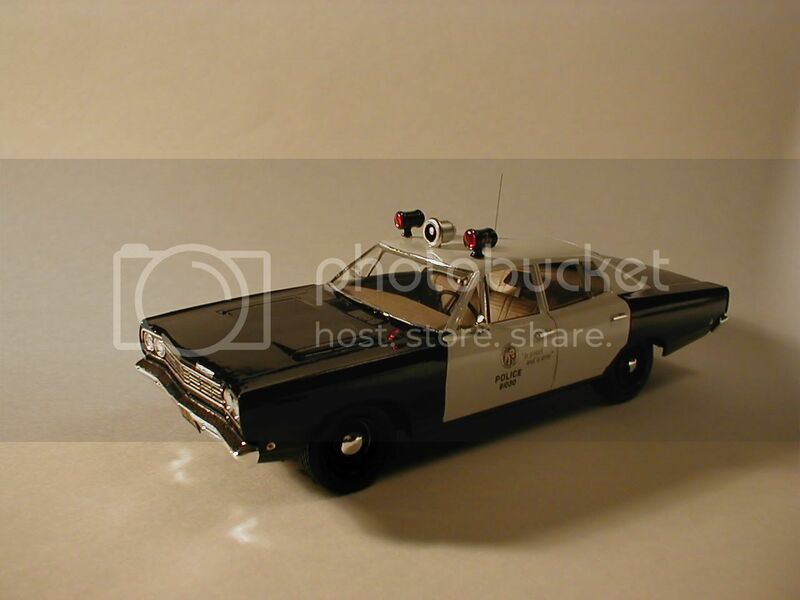 Great job of depicting the '68 Plymouth. Speaking of Adam-12, I got the 1st season box set on DVD for Christmas. I had forgotten how good the 1st year was. I was always more fond of the later years ('71-'75). I can't wait for the following years to come out on DVD. I married my wife for her looks, just not the ones she gives me when I bring home new model kits. I like this build, but the flag at the bottom by Photobucket is annoying!